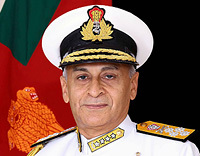 March 04, 2013: H-190, the fourth dozen air cushion vehicles (ACVs) or hovercraft designed and built by UK's Griffon Hoverwork Limited (GHL), has joined service with the Indian Coast Guard, and was commissioned into service by outgoing Coast Guard DG Vice Admiral M.P. Muralidharan. The 21 m long hovercraft with a 31 tonne displacement can achieve a maximum speed of 45 knots. According to the ICG, the H-series of craft will put to use for missions across the spectrum, including surveillance, interdiction, aearch and rescue and rendering assistance to small boats/craft in distress at sea. ICGS H-190 will be based at Mandapam under the Administrative and Operational Control of the Commander Coast Guard Region (East). 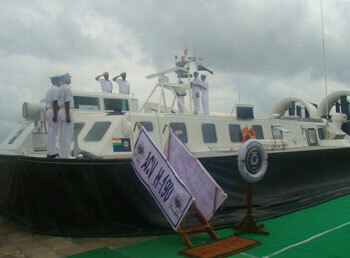 The brand new craft is commanded Commandant R. Suresh and has a crew of two Officers and ten Enrolled Personnel. The remaining eight hovercraft will be delivered over the course of the next 12 months to the Coast Guard and will be deployed at stations along the coastline. 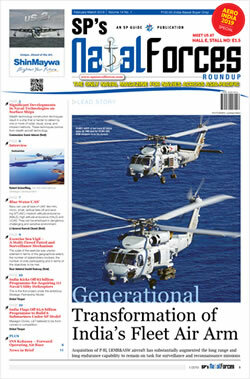 The ICG may float a follow-on requirement considering the performance of the boats already in service.